The Comandante Ferraz Antarctic Station (Portuguese: Estação Antártica Comandante Ferraz) is a permanent Antarctic research station named after the Brazilian Navy Commander Luís Antônio de Carvalho Ferraz, who visited Antarctica many times with the British exploration team and managed to convince his government to create a self-guided Brazilian Antarctic Program. 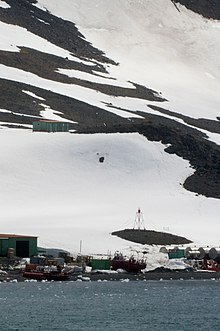 Located in Admiralty Bay, King George Island, near the tip of the Antarctic Peninsula, 130 km from the South American continent, the station began operating on 6 February 1984, brought to Antarctica in modules by the oceanographic ship Barão de Teffé (H-42) and several other Brazilian naval ships. It now houses about 60 people, including researchers, technicians and staff, military and civilians. The station was named after Navy Commander Luís Antônio de Carvalho Ferraz, a hydrographer and oceanographer who visited Antarctica twice on board of British vessels. He was instrumental in persuading his country's government to develop an Antarctic program, and died suddenly in 1982 while representing Brazil at an oceanographic conference in Halifax. The station was built on the same site of the old British "Base G", and the weathered wooden structures of the old base made a sharp contrast with the bright green and orange metal structures of the Brazilian station, which was first set up on 6 February 1984. Above the site of the base there is a small cemetery with five crosses: three of them are the graves of British Antarctic Survey (BAS) personnel; the fourth commemorates a BAS base leader lost at sea, and the fifth cross is the grave of a Brazilian radio operator sergeant who died of a heart attack in 1990. On 25 February 2012, an explosion in the machine room that housed the station's generators ignited a fire that, according to the Brazilian navy, destroyed approximately 70% of the complex. Two soldiers, originally reported as missing by the Brazilian navy, were found dead in the debris of the station after the fire, while a third one sustained non-life-threatening injuries. Material damage to the base was calculated at US$12.4 million. At the time of the incident, the Brazilian government estimated it would take two years to rebuild the research station. In August 2012, the station was fully dismantled, with approximately 800 tonnes of debris being shipped back to Brazil. The Brazilian government released U$20 million for the construction of 1,000 square metres (11,000 sq ft) of emergency modules to temporarily house researchers until a permanent station is rebuilt. The construction of the temporary station was completed in May 2013. On 15 April 2013, the Brazilian Navy announced it had chosen the winning design for the new Comandante Ferraz base. The winning proposal went to the Curitiba-based Estúdio 41 architecture firm. The new station will have 3,200 square metres (34,000 sq ft) and will accommodate 64 people. The cost of the project is approximately US$ 100 million. The station is expected to be operational by 2018. The main objective of the Brazilian Antarctic program lies on climate change research, such as global warming, the greenhouse effect, ozone depletion and the raising level of the oceans. The personnel working at the station collect samples of pollutants which often come from overseas. They also carry out research in meteorology, continental and marine geology, oceanography, astrophysics, geomagnetism, and nuclear geophysics. Refuge Pe. Balduino Rambo (dismantled). ^ Caldas, Mariana. "Brasil terá pela primeira vez uma estação científica no interior da Antártida" (in Portuguese). UOL. Archived from the original on 31 December 2012. Retrieved 29 February 2012. The module Criosfera 1 is located at 84 degrees south latitude, about 500 miles from the geographic South Pole, while the Comandante Ferraz station is now located at 62 degrees south latitude. ^ BAS Admiralty Bay Station G British Antarctic Survey. Retrieved 27 February 2012. ^ O nome da Estação Brazilian Navy. Retrieved on 2013-09-13. (in Portuguese). ^ Nota à Imprensa 3 – Incêndio na Estação Antártica Comandante Ferraz ("Press Release 3 - Fire at Comandante Ferraz Antarctic Base") Archived 2012-04-17 at the Wayback Machine Brazilian Navy. Retrieved 2012-02-26. (in Portuguese). ^ Two die in fire at Brazil's Antarctic research station BBC. Retrieved 26 February 2012. 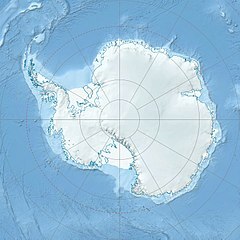 ^ a b c Brazil to open US 52 million research base in Antarctica SciDev. Retrieved on 2013-09-13. ^ (in Portuguese) Base da Marinha na Antártida será reconstruída em 2 anos, diz Amorim ("Navy base in Antarctica will be rebuilt in 2 years, says Amorim") G1. Retrieved 26 February 2012. ^ Brasil conclui obras de estação provisória na Antártica. Zero Hora. Retrieved on 2013-09-13. (in Portuguese). ^ Reconstrução. Brazilian Navy. Retrieved on 2013-09-13. (in Portuguese). ^ "Brazil starts building snazzy new research station in Antarctica". Retrieved 16 January 2017. ^ "Climatologia de Ferraz" (in Portuguese). Centro de Previsão do Tempo e Estudos Climáticos. Retrieved 6 April 2016. ^ a b "Antarctica". The Lighthouse Directory. University of North Carolina at Chapel Hill. Retrieved 23 May 2017. ^ a b c d e f List of Lights, Pub. 111: The West Coasts of North and South America (Excluding Continental U.S.A. and Hawaii), Australia, Tasmania, New Zealand, and the Islands of the North and South Pacific Oceans (PDF). List of Lights. United States National Geospatial-Intelligence Agency. 2017. Child, Jack. Antarctica and South American Geopolitics: Frozen Lebensraum. New York: Praeger Publishers, 1988. (in Portuguese) Menezes, Eurípides, A Antártica e os Desafios do Futuro. Rio de Janeiro: Capemi Editora, 1982. (in Portuguese) Castro, Therezinha, Atlas-Texto de Geopolítica do Brasil. Rio de Janeiro: Capemi Editora, 1982. Wikimedia Commons has media related to Estação Antártica Comandante Ferraz.